Galeria Wroclavia – a Modern Place for Shopping and Entertainment | ALUPROF S.A.
Galeria Wroclavia is the highest-class, elegant shopping and office complex designed by the architectural studio IMB Asymetria. The irregular and massive shapes of the building combined with aluminium accents are a great backdrop for the development of central Wrocław as well as a frequent meeting place for the city’s residents. The modern architecture, glazed entry and roofs, illuminated three-dimensional elevations and natural forms and materials as well as a kingdom of greenery in the form of a year-round garden – this is the best description of Galeria Wroclavia. The building is located in the immediate vicinity of the Wrocław Główny railway station and integrated with an underground gallery located under the main bus station in the Krzyki district on Sucha, Dyrekcyjna and Borowska Streets. The construction of the building began in the fourth quarter of 2014 and was completed in October 2017. The usable area of the three-storey building is 71 thousand m2, most of it is commercial area – 64 thousand m2, housing 200 shops, while less space occupies offices – 7 thousand m2. The facility under one roof brings brings together a variety of shops, restaurants, cafes, and also a multiplex cinema, a 24-hour fitness club and a playground for children. Wroclavia is an example of perfectly combining commercial and public functions, architecturally realized on a grand scale with attention given to both the comfort of the users and the environment. Lighting? The best is natural! The unique and friendly atmosphere of Wroclavia is a result of natural light streaming through 10 skylights from the ALUPROF MB-SR60N DACHY system. This system is a construction developed and used for the first time in the Katowice Gallery. It gives the possibility to make a complex roof structure with very good sealing and thermal insulation. “It uses 60 mm wide aluminium profiles and is highly durable. The sealing of the system is ensured by the EPDM sheathed seal. Its connections, like window sealing, was performed using silicone grout” explains Bożena Ryszka, Marketing Director at ALUPROF S.A. The set of glazing slats used in the ALUPROF MB-SR60N DACHY system facilitated making connections with angles ranging from 0 to 20 degrees and using various trapezoidal and triangular window shapes. “Thanks to this it was possible to obtain a lot of freedom in shaping the construction” added Bożena Ryszka. The roofs made using this system in Galeria Wroclavia constitute a total of approx. 3 thousand m2 of glazing. The building’s large vertical glazing, windows, doors and transparent fire barriers are also structures in which ALUPROF systems were used: mullion and transom walls, MB-86 window and door system, MB-45 internal walls and doors as well as MB-78EI and MB-118EI fire barriers. The vast area of the centre includes not only typically shopping, service and entertainment functions. There are also places to relax, greens, gardens and a fountain. The green terraces of Wroclavia have a combined surface area of more than 4 thousand m2 and occupy a space of more than half of a football pitch. A large part of Wroclavia’s elevation on Joannitów Street has the form of year-round green walls. The interiors of the building also have natural, vivid greens that make visiting the gallery more pleasant. All of these solutions have contributed to creating an atmosphere close to nature in the very centre of the city. These are not the only elements demonstrating the care of the designers and investor for the friendly nature of the building for its users and the environment. 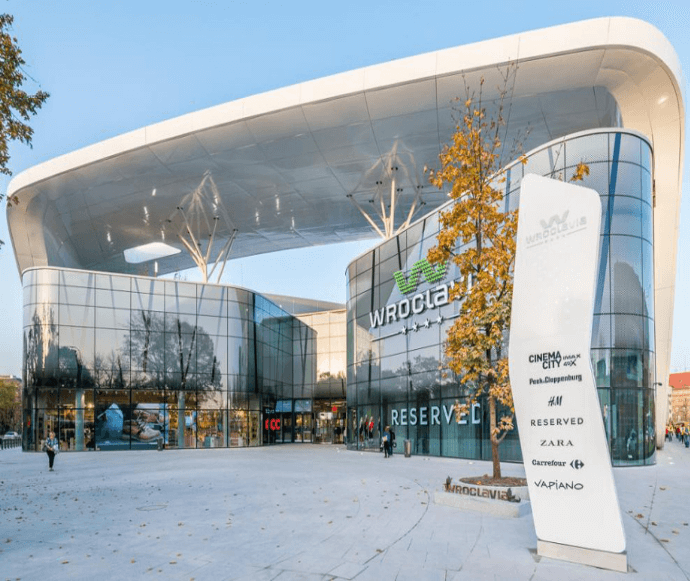 Back at the design and construction stage the shopping part of Wroclavia obtained a BREEAM certificate in the Excellent grade, obtaining 81.3 percent points, which so far is the highest result in all of Europe for a shopping centre under construction. In the framework of the BREEAM certificate comprehensive analyses and forecasts were conducted for several dozen areas of the building’s impact on people and the environment, energy and water consumption as well as their monitoring, carbon dioxide emissions, waste management, access to public transport and also sustainable management of the entire building. During the construction of Galeria Wroclavia a specially designed leak detector was used that enabled the monitoring of water consumption, motion sensors regulating light intensity and a device that reduces CO². Care for the natural environmental in this building has even one more dimension: the investor plans to install beehives on the centre’s roof so that they can pollinate flowering plants near Wroclavia while also producing honey. Galeria Wroclavia thanks to its innovative design, exceptional commercial offer, high-quality services and finishing standard as well as many pro-ecological solutions is a place often visited by the residents of the city and all of Lower Silesia. This building makes an excellent great impression not only from the perspective of its users, but above all lovers of modern architecture.